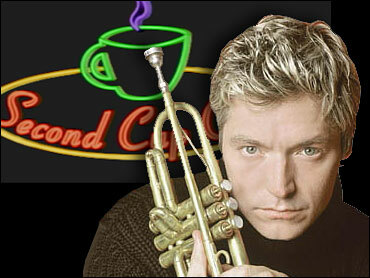 Jazz trumpeter Chris Botti returned to The Saturday Early Show's Second Cup Cafe with selections from his new album, "A Thousand Kisses Deep." Botti uses a trumpet as his voice, exploring a range of music from contemporary jazz to eclectic art-rock. "A Thousand Kisses Deep" is his fifth solo CD. He is also in demand as a session player, most recently for Sting's "Brand New Day" tour. A native of Oregon who was born in Portland and grew up in Corvallis, Botti started playing trumpet in the third grade as a sort of rebellion against his classically trained pianist mother, who wanted her son to take up the piano. By the time he reached the age of 11 or 12, he discovered the smooth ballads of Miles Davis with the second Quintet. Botti says after moving to New York City in 1986, he realized being a strict jazz musician wasn't his calling. He loves improvising, but not the bebop tradition, he explains. But he continued to play music, with his own flair. Botti's solo debut, "First Wish," was released in 1995; his second effort, "Midnight Without You" (a collaboration with English ambient pop group The Blue Nile) appeared in 1997, followed by "Slowing Down the World" in 1999. The Academy Award-winning film composer John Barry cast Botti as the featured soloist in his orchestral score "Playing By Heart." Botti also composed and performed the score for the Robert M. Young film, "Caught." And he's worked with music legends such as Frank Sinatra and Quincy Jones. "A Thousand Kisses Deep" may contain his most diverse work. He chose timeless standards such as Burt Bacharach's "The Look of Love," and the Rogers and Hart classic "My Funny Valentine." The CD also has lesser-known songs such as "A Thousand Kisses Deep," by Leonard Cohen. Botti sums up "A Thousand Kisses Deep" as "a more mature and expansive version of the kind of thing I started doing eight or nine years ago. I'm chasing the ultimate chill-out vibe. I'm trying to create music that is beautiful and sophisticated at the same time."